Thailand's capital, Bangkok and the capital of Vietnam, Hanoi, are two popular destinations in South East Asia. They are separated by less than two hours of flying time and are often compared by food, culture, and livability. Which is the better city to visit and to live in long-term? If you search the internet for a comparison between the two cities you will get two types of results. 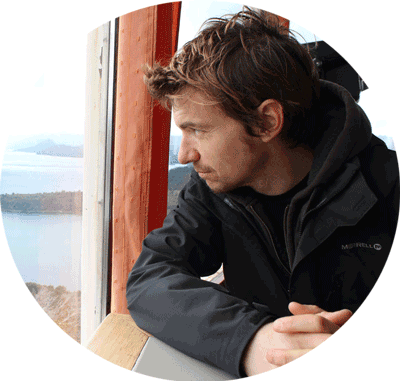 Expats, Digital Nomads, and lifestyle entrepreneurs comparing the two places based on living there long term. Each type of traveller will have very different experiences of these cities because visiting a city for a day or two is only touching the surface. On the other hand, a few days in a city is a great way to get the ‘best of’ that place. So I’ve compared the cities based on both short-term visitor and long-term visitor experiences. Expats will always see a city differently to tourists. If we take the example of Las Vegas, many people love to spend a weekend in that city but a much smaller percentage would like to live there. 12 Which City Would You Choose? Let's start with this topic as it seems to be the one that sways most people. First of all, both cities are cheap if you're coming from Western Europe, the US, and any other fairly developed country. Whatever way you look at it, you will need more money to live in Bangkok. The bulk of this extra cost will be for accommodation as Bangkok property prices are moving skyward quickly. Bargains can be found all over Hanoi and foreigners will find it easier to rent long-term without contracts or complicated paperwork. Food costs from street vendors tend to be about the same in both citis. If you plan on eating in restaurants a lot then you'll spend more in Bangkok, especially in the tourist areas. 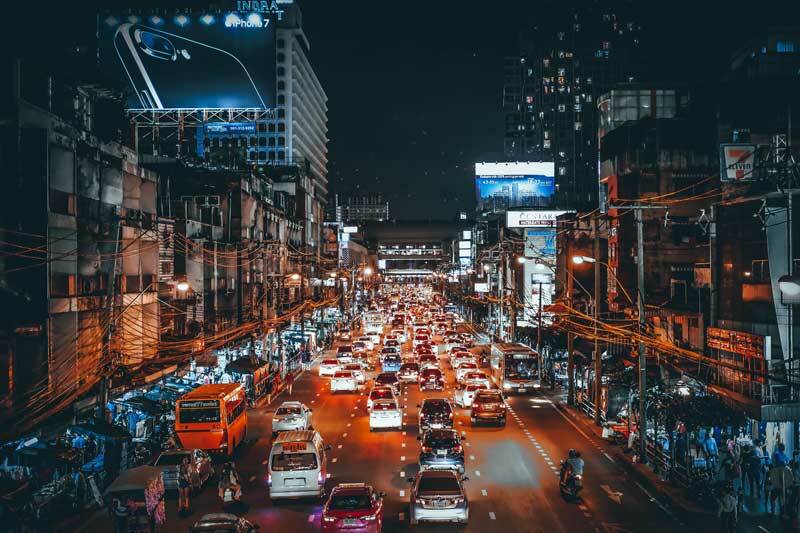 Want to learn how to save money in Bangkok? 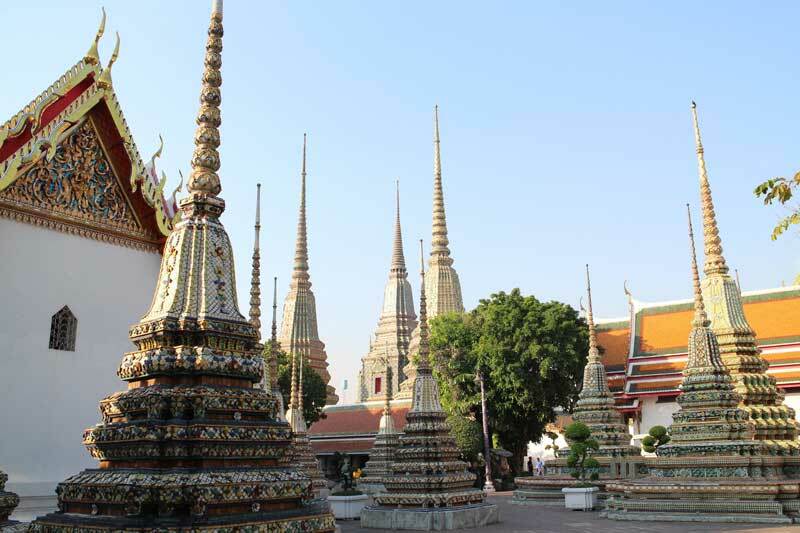 Read our Budget Bangkok guide! Transport costs depend on your preferred travel mode. Bangkok has the BTS which averages out at around US$0.40 per journey (every journey is different so I picked a middle-ground number that will make sense to most people). Taxis are pretty cheap in Bangkok if you take them during normal hours outside of the real tourist enclaves. Buses in Hanoi are extremely cheap but not very convenient. Motorbike is the preferred mode of transport here and running one can be really cheap. Groceries work out around 20% more expensive in Bangkok than Hanoi so if you like to cook for yourself this is an important factor. ATMs are everywhere in BKK, less so in Hanoi, but can still be found in malls and big hotels. If you need to transfer money try one of these money transfer services. For more information on using ATMs and saving money in Bangkok see our Budget Bankok guide. If you are visiting either location for a short period of time then check out some accommodation options. Don't attempt to receive anything in the post in Hanoi as you've got a 50% chance of receiving it. 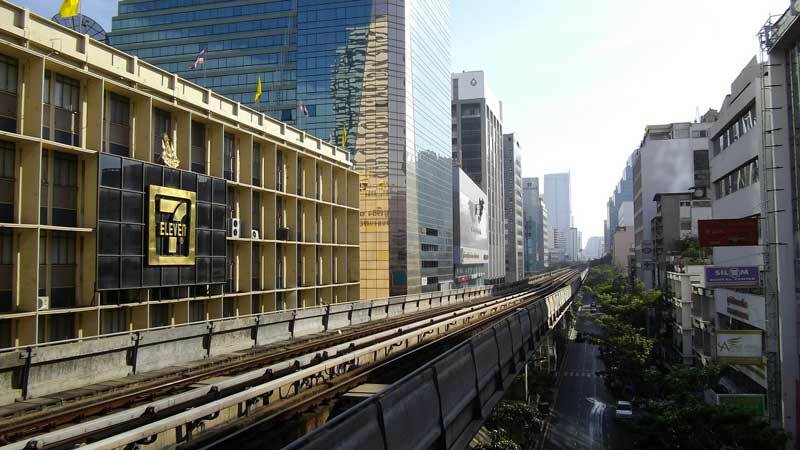 Bangkok's postal system is modern, efficient, and fast. When you’re on a whirlwind trip around the world, noise and craziness, part of every big city, can be exhilarating. New sights and sounds form part of what makes travel interesting. Asian cities are renowned for their hustle and bustle. In modern times, cars and motorbikes make up most of the wall of sound you’ll experience on a daily basis. Construction is another issue to deal with. Don’t rent an apartment or hotel next to a construction site (always ask ahead). My personal pet peeve is motorbikes. Nothing against bikers but the sound of a very badly tuned motorbike whizzing by sets my teeth on edge. The constant pounding on my eardrums can be very tiring. Not to mention the honking of horns. In this respect, Bangkok wins hands down. Anyone that has been to Hanoi will know what I’m talking about. Hanoi is noisy, very noisy. Yes, it’s kind of funny and exciting to see more motorbikes than you’ve ever seen before. Hearing the constant blaring of horns as the sea of bikes snakes around the city is part of the experience. But try living there for a long time. The novelty soon wears off. There are fewer motorbikes in Bangkok. On the other hand, there are more cars but Thai people seem to be less eager to honk than the Vietnamese. In Bangkok I rarely hear anyone using the ‘Egyptian brake pedal’, but it’s the dominant sound of Hanoi. Away from the main streets of Bangkok, the noise level is pretty low. There are certain areas of the city though that seem to be 24-hour party zones so pick your apartment wisely or you might end up near a night club. 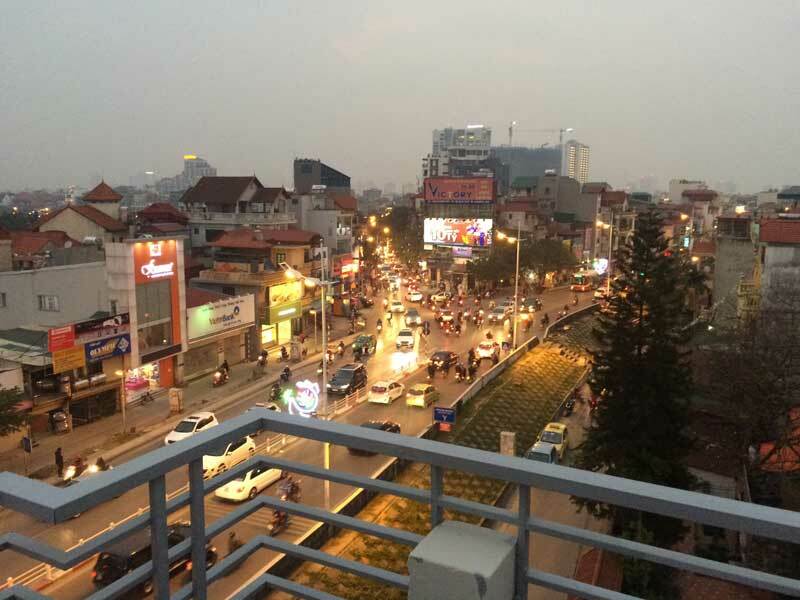 Hanoi’s nightlife is much less developed and most places close at midnight. But you’ll never get away from the motorbikes. They make it to every little alleyway and the honking is part and parcel of riding a motorcycle. I like walking. I can walk around parts of Bangkok. The entire city is too big to navigate by foot and the heat is intense but if I want to walk I can use pavements that are relatively intact. The sidewalk is also not crowded with motorbikes, trees, and other obstacles that plague Hanoi's sidewalks. Hanoi is not a city for walking, and as a result, nobody does it. Motorbikes are the de facto mode of transport. If you don’t bike you’ll be living at another pace to 99% of the locals and tourists. Have you ever seen a shoal of fish underwater opening out to allow large fish or divers pass through the centre of the shoal? That’s the image that stuck in my head the first time I crossed the road in Hanoi. Here's how one crosses the street in Hanoi. Look briefly in the direction of oncoming traffic. Without hesitation (because that shows fear and uncertainty), step out into the street. Feel extremely vulnerable as hundreds of motorbikes whizz in front and behind you without even touching the brakes. Enjoy the melodious tones of motorbike horns up close! Walk briskly to the other side matching the speed at which bikes and cars can safely dodge you. Repeat on the lane going the opposite direction. The BTS Skytrain is a really great way to get around Thailand’s capital. It’s safe, clean, air-conditioned, and relatively cheap. It doesn’t suffer from traffic jams and you won’t breathe in a lung full of toxic air when you take it. The system runs until midnight, after which you can take taxis, which as I mentioned, are inexpensive. Bangkok storms ahead on the topic of transport. The BTS system is cheap and efficient. Taxis are very cheap and much better value than in Hanoi. There’s also Grab Taxi available in both cities. Grab is basically the Asian version of Uber but offers motorbikes and different priced taxis. It can be a very cheap method of getting around. Get the IOS app here, and the Andriod app here. Bangkok doesn’t have the same motorbike culture and the BTS/Taxi costs can add up over time. Hanoi isn’t a hub and your travel options are a lot more restricted when you want to explore Asia. You’ll often have to fly through Bangkok anyway just to make the connection to your destination. Getting from Bangkok to Hanoi and vice versa is easy enough. You can fly, take a bus, or a train. I’d recommend flying. AirAsia promos can make the trip a very inexpensive one. A flight from Bangkok to Hanoi will cost as little as US$50 if you book in advance. Always check with booking gateways such as Expedia before deciding. Hanoi to Bangkok works in the same way but for one-way flights it might be cheaper as Bangkok is a hub. Pollution is the big issue in both places. Bangkok and Hanoi are capital cities and are magnets for migrants from the rest of the country. As a result, the populations of both cities is increasing rapidly. Pollution from traffic and large industry means that neither place will win any medals for clean air anytime soon. People with respiratory problems might Hanoi to be unbearable. The exhaust fumes, dust, and other contaminants in the air can make your eyes water and your lungs wheeze and cough. Hanoi has also recently been competing with Beijing for the most smoggy city on earth (at least it was for a few days in late 2016 and early 2017). Don’t expect a whole lot of greenery in either place but Hanoi definitely has more trees dotted around the city. Parks are hard to come by, though. 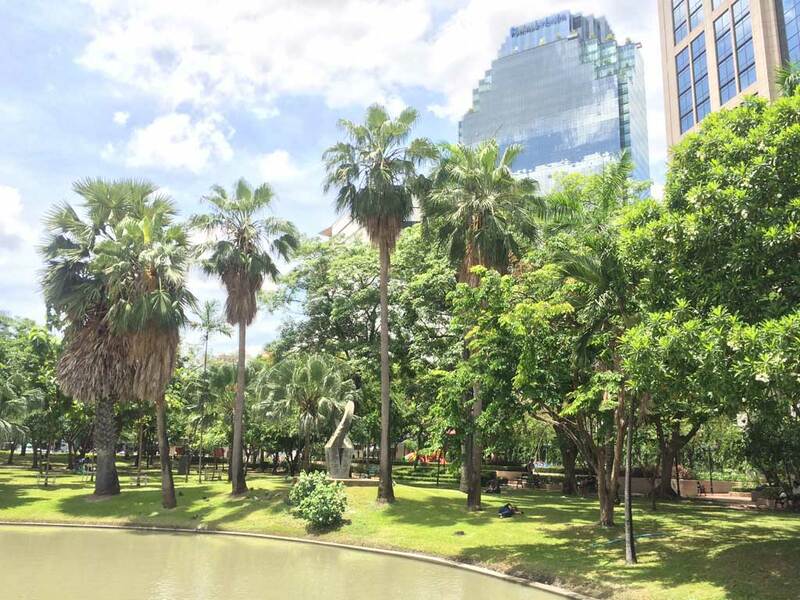 Bangkok is pretty barren but has swathes of green areas such as Lumpini Park. 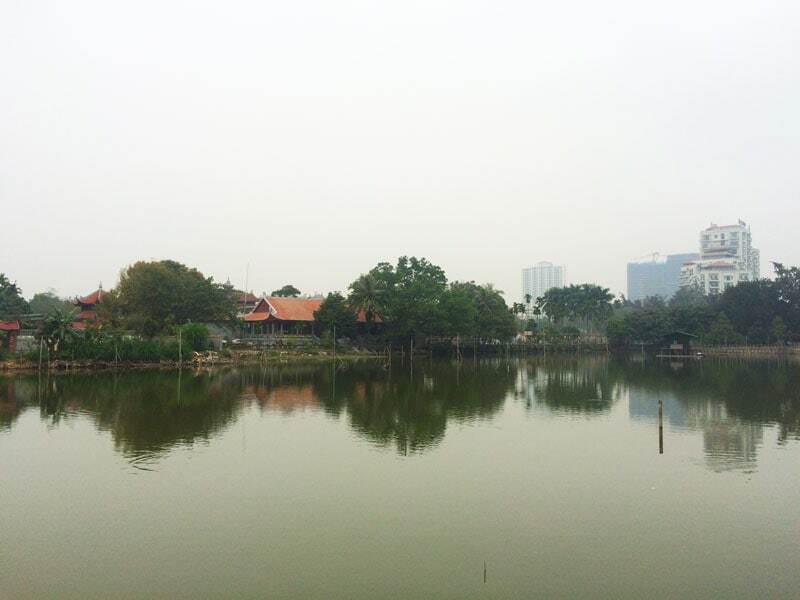 Both capitals are beside rivers but Hanoi also has two lakes. 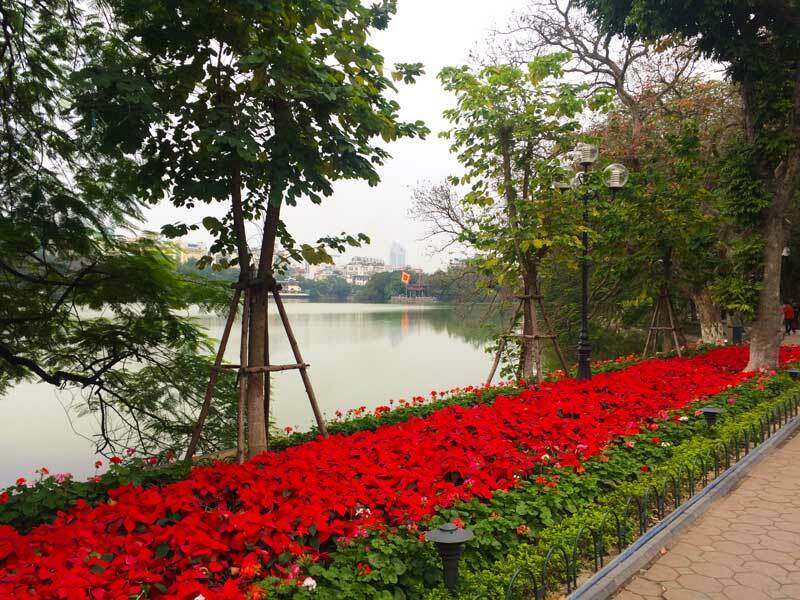 Hoan Kiem lake, the smaller of the two is a very pleasant place to hang out. Situated beside the old quarter and in the middle of the hustle and bustle, Hoan Kiem is a good backdrop for strolling and take photos. The larger lake, Tay Ho, is less interesting but does have some areas for walking. Unfortunately, walkways in Hanoi are often extremely narrow and have trees planted in the middle of them. Bangkok's river is a tourist attraction in itself. The river flows just to the west of the centre of the city and is flanked by temples, palaces, and markets. Taking a trip on the river is inexpensive and easy to do. This is a tricky one to compare as the weather is generally the same all year in Bangkok but changes with the seasons in Hanoi. 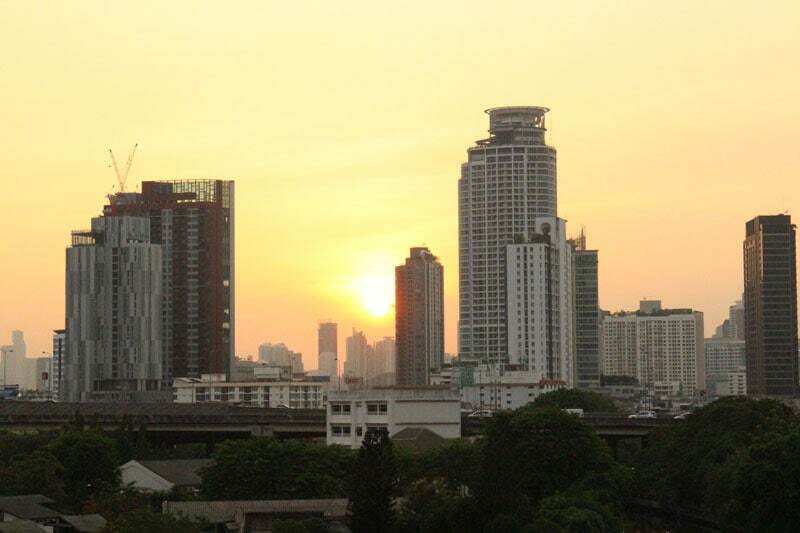 If you like the heat then Bangkok is the place for you. If you like seasonal changes with heat in Summer, then Hanoi is a better option. In Spring the temperature is pleasant and you won’t sweat walking around. However, the city is prone to long periods of overcast skies. It can also get very cold in winter. Bangkok, on the other hand, is hot and humid. Period. Some people like it. Personally, I like the blue skies every day in Bangkok and Hanoi’s changeability irritates me a little. Do I need both a warm jacket or shorts and t-shirt again today? Getting a tourist visa for Vietnam is a bit more complicated than for Thailand. There are a small number of nationalities that don’t require a visa in advance and get 15 days in the country on arrival. For the rest of us, applying for a 15-day visa from a Vietnamese embassy is a bit of a drag. Thailand gives a 30-day visa (extension) on arrival to the citizens of most western countries and many other nations. Where Vietnam beats Thailand is in the longer term visas. If you have a contact in the country or can get an agency to help you, getting a 90-day visa is no more complicated than getting a 15-day one. You will need a letter of invitation from the agency or contact. Thailand doesn’t offer this kind of visa to tourists. You can stay for 90 days as a tourist but you will first need to get a 60-day one from an embassy or consulate, and then apply for a 30-day extension, while in the country. For more information on Thailand's visas visit the excellent Live Less Ordinary. If you're in Thailand and considering going to Hanoi read TravelFish's post about getting a visa for Vietnam. This is a contentious topic. Both countries have long histories. Both nations are proud, have their own amazing foods, dances, and music. I hate to mention the old cliché of Thailand being the “land of smiles”. But it’s true. And for me, it’s one of the main reasons to visit or live in Bangkok over Vietnam. Vietnam is a communist country and Thailand until recently, was a constitutional monarchy. Right now (2017) and since 2014, the country is administrated by a military council. So neither country is a beacon for human rights or freedom of speech. The LGBT community will be much more accepted in Bangkok than Hanoi. Thailand is a predominantly Buddhist country and although the people of Vietnam do not officially have a religion, many people visit temples to pray. You can visit beautiful Buddhist temples in both countries and I recommend doing so. This one will depend on what kind of things you like to do in your spare time. Are you a theatre buff, fitness fanatic, club hopper, barfly, or live music fan. However, if we take the random general topics of ’nightlife’, ‘sporting facilities’, ‘cultural centres’, ‘health and wellness’, and ‘entertainment’, Bangkok leaves Hanoi far, far behind. There are endless possibilities for entertainment in Thailand's capital city. Gym, yoga studios, and massage parlours are everywhere. Shopping is on a world-class level. Live music venues can be found in almost every area of the city. Hanoi feels more like a small town. It's almost the same size (population wise) as Bangkok but doesn't compete with it on entertainment possibilities. If you enjoy meeting people then Bangkok offers a lot more in the way of Meetups, and expats events. Although I prefer Thai food in general, I am going to give Vietnam the edge here. Vietnamese cuisine is so fragrant and aromatic that it makes a bigger impression on the senses than Thai food. Spicy soup loaded with noodles and meats and cooked for hours with cilantro, basil, fish sauce, and ginger has a sensational taste. This dish, called Pho (pronounced Fuh or Fuhr) is one of the best known Vietnamese creations and is something I crave for when I’m outside of the country. Once, I’m there I binge on it until I can't eat any more. 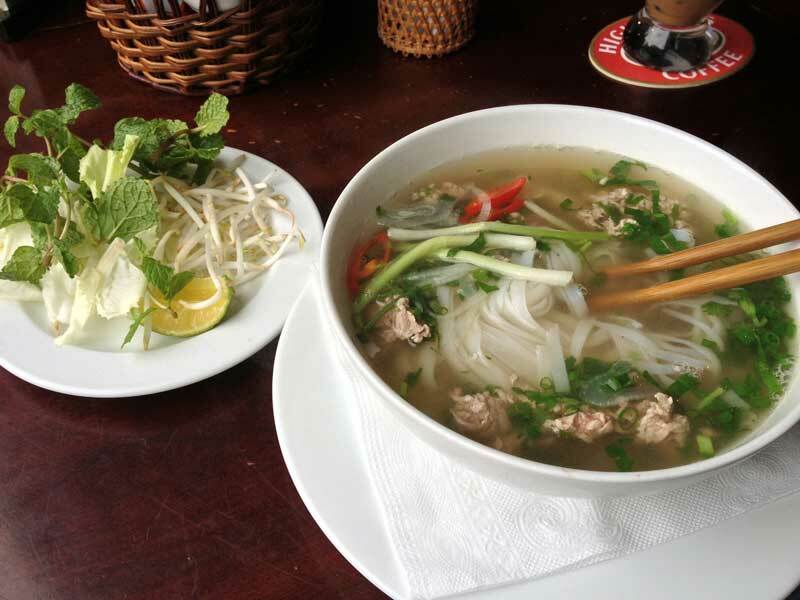 Vietnamese food styles vary throughout the long, narrow country, but Hanoi has probably the best concentration of high-quality dishes and local ingredients. 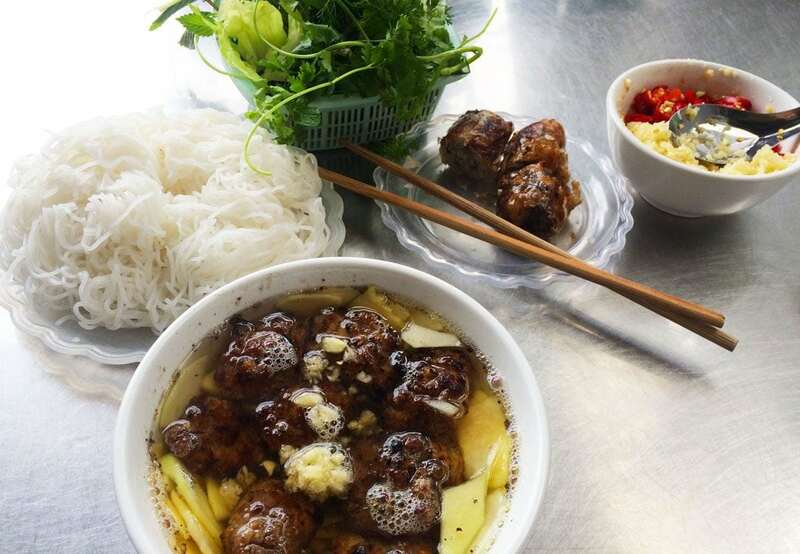 The Old Quarter of Hanoi is one of the best places in the world to treat your taste buds to some exciting new foods. This is street-food central. Whether you buy from a street vendor or simply sit on the sidewalk on tiny plastic chairs, the experience is the same. Tasty, inexpensive dishes that you won’t find anywhere else. Eating is also cheaper in Hanoi than Bangkok which won’t affect short-term visitors too much. But for long-term travellers, eating in Hanoi will be kinder to your bank account than eating in Bangkok. The ‘street food' in both countries is amazing but I draw the line at eating dogs, as they like to do in some parts of Hanoi. Crime levels in both cities are similar. Personally, I find both cities to be safe and I never felt threatened walking alone or at night. There is the ever-present problem with scams but violent crime against foreigners is not common. 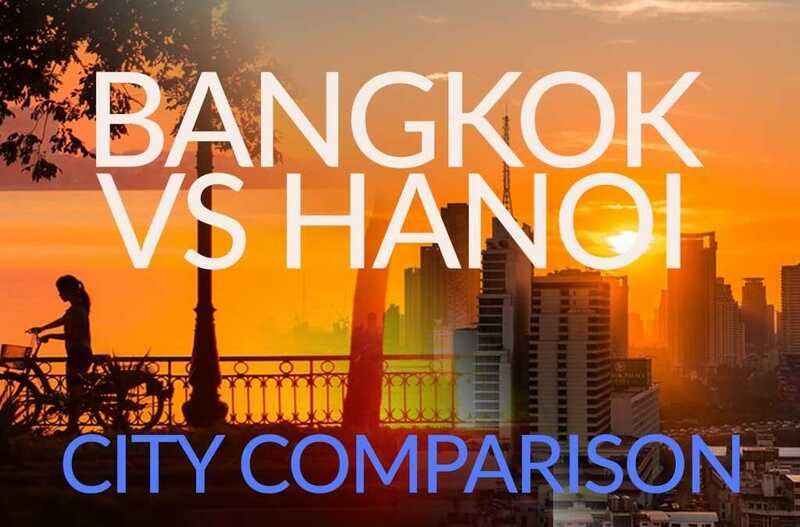 Nomadlist.com gives Bangkok a safety rating of ‘good’, whereas Hanoi gets a rating of ‘Okay”. 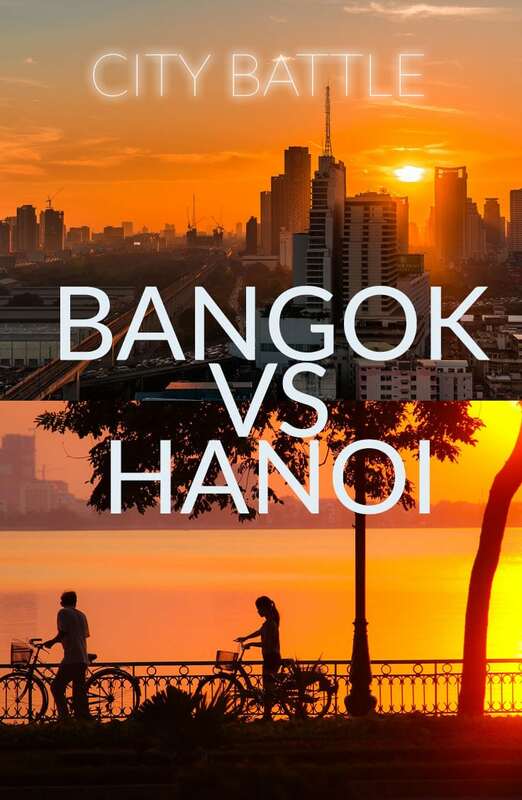 According to Nomadlist.com, both cities are similar in the level of crime, with Bangkok being the less safe of the two. Note: statistics from both sites are based on user input and are not based on official figures. So there you go. An opinionated guide for sure, but one that I hope helps people choose between the two cities. I’ve tried to be balanced, but I definitely favour Thailand’s capital over Vietnam’s main city. When I was considering relocating to one of the two cities I read many blog posts about Hanoi. Most of them were favourable reviews or comments. People have different motivations for choosing one city over another. 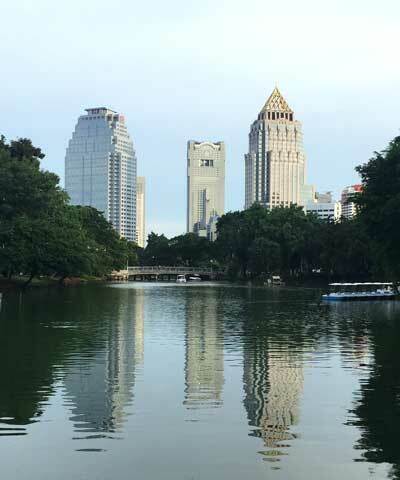 Some prefer the really ‘broken’ feel of Hanoi over Thailand’s more modern and sanitised city. Digital nomads and long-term travellers will find Hanoi’s visa system and cost of living much more favourable. However, my preference is to spend a little more but live in a city with a better lifestyle factor. Bangkok, for me, is one of the best Nomadlist.com in the world. Hanoi is great for people that want to get away from traditional expat hubs and more tourist-oriented locations. Have you been to both cities? What are your impressions?